Kenneth Leslie (1892-1974) was a Canadian poet and political activist whose poetry deserves to be rediscovered for its mastery of form, meter, and language. His first four, of a total of six, books were published in the 1930s, when the Modernist movement in American and European poetry (led by Ezra Pound’s dictate to “make it new”) was freeing poetry from the perceived constraints of meter and form. Though Leslie was awarded the Governor General’s Award, Canada’s top literary honor, in 1938, for his fourth book of poetry By Stubborn Stars (which featured a 28-sonnet sequence by the same name) the waves of Modernism would soon leave him in its wake. 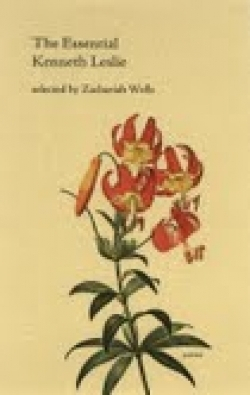 Editor Zachariah Wells has carefully selected Leslie’s work in The Essential Kenneth Leslie, presenting poems that showcase the variety of forms he uses, as well as his range of subjects. The poems in this collection function as a window into Leslie’s world: his beliefs (that formal education makes dullards of its students in “Cobweb College” and “Tea with the Professor”); his tumultuous personal life (his separation from his wife and estrangement from his children in “By Stubborn Stars”); and his artistic convictions (that true beauty lives in the commonplace in “Beauty Is Something You Can Weigh in Scales”). Additionally, Wells subtly arranges the poems in small groups by mood and topic. Readers are able to give the poems more individual attention and share in Leslie’s feelings without the risk of being overwhelmed by them. The true beauty of Leslie’s poetry lies in his often stunning use of language. His seemingly simple word choices, combined with his attention to meter and form, may remind readers of the early work of W. B. Yeats. Additionally, he draws readers in with sound (“waiting for the snow, / the foam of bloom forgotten”), at times reminiscent of Gerard Manley Hopkins. But the daring of Leslie’s work stems from his desire to reveal the complex dualities with which he wrestled in his personal life. From the double entendre in “the crotched necessity of standing true / to her while pledging life and love to you” to the moody repetition of “this monster ledge / of granite under granite clouds,” Leslie’s language lingers in the mind and on the tongue. The Essential Kenneth Leslie is a finely-crafted book that readers of poetry will enjoy having in their hands. In the simple, inviting cover design, the lasting Smyth-sewn binding, and the clean, antique-feeling font, the publisher’s attention to detail reveals a love of books and the authors it showcases.